If you’re in a raiding guild, chances are DBM or one of its counterparts is a requirement. There’s not much to say about this. Download the mod, it’ll scream at you and flash a big blue warning across your screen when you’re standing in something bad or the boss is aiming a vile of goo at your head. It will also give you timers for any boss abilities of note, and make announcements in raid chat. As far as setup goes, the only modification I make to the default settings is to move the timer bars to the bottom right of my screen, where they are out of the way, but still visible if I need them. For my scrolling combat text, I use Mik. It can be customized to show you whichever events you want. I personally have it show me almost everything. The only things I turn off are buff and power gains, to avoid a little bit of spam. Power Auras is a mod that can provide visual and audio cues when certain events happen. This can be anything from getting a buff or debuff, a trinket proccing, a spell coming off cooldown, or a warning of when you drop to a certain amount of mana or health. When I first downloaded power auras, I found it a little confusing, so here’s a basic explanation of how to set up a new aura. 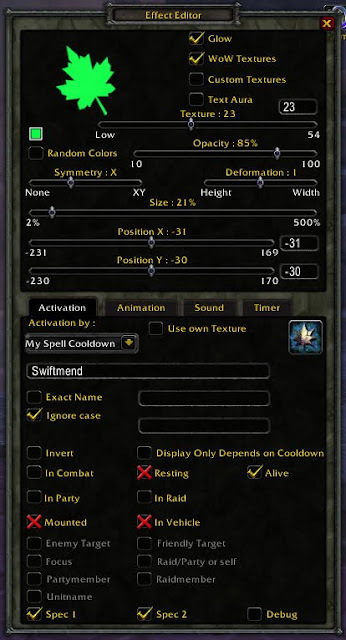 We’ll create an effect that displays when Swiftmend is ready to be used (off cooldown). Type /powa to open up the menu. Select New to create a new aura. This will bring up the effect editor. In the bottom half of the menu, under Activation, select: My Spell Cooldown (take a look at the other options in this menu to get a better idea of all the types of events you can use power auras for). Type Swiftmend in the box below. You can also use the spell ID. The rest of the Activation tab lets you specify when you want to see this aura. Since I usually only use Swiftmend in combat, I’m going to cross out the options resting, mounted and in vehicle, so I don’t have to see the effect when I’m running around Dalaran. You can also specify whether the aura should be visible for both or only one spec. The Use own texture box will cause the aura that appears to look like the Swiftmend icon. The top half of the effect editor box lets you choose the texture that will display. Move the texture slider to browse through the available textures. Checking the Wow Textures box displays a whole new array of options. Once you’ve picked a texture you like, you can select the color, size and position. Your aura will now be displayed in the menu screen. Click the aura and press the Test button to see how it looks. If you want to change anything, you can edit it. You can also add animations, sounds or timers to any aura, by choosing the appropriate tab in the effect editor. I mostly use Power auras to let me know when my spells are off cooldown. These include Swiftmend, Nature’s Swiftness, Wild Growth and Barkskin. I also have an effect show up, along with a radar “blip” sound, when I’m at 70% mana to let me know when to Innervate. The textures I chose are quite druidy – two leaves and a paw. Not sure what the texture for Nature’s Swiftness is supposed to be, I just thought it looked nice. There are a number of other auras that could be useful to resto druids (things like Innervate or Rebirth cooldowns, Omen of Clarity Procs, missing buffs) but my five auras are sufficient for me. For some more ideas on what kind of auras to set up, take a look at Tree Bark Jacket, Dreambound or Revive and Rejuvenate. This entry was posted in WoW and tagged addons, mik scrolling combat text, power auras, UI. Bookmark the permalink. Awesome post! Thank you so much for sharing your insights, and in such a methodical and didactic way. This is one of the best written and (specially) illustrated UI articles I have read to date. You convinced me to give unit frames another try, and showed me a great layout for the frames and the grid. I use Healbot instead of Grid+Clique, but the final goal is the same. I am happy enough with the default buffs and the minimap location from Blizzard, too. Good to see someone else doing the same. You were also the first one to present me a convincing case for combat text, by showing yours in action. Have I said I loved your screenshots and the way you used them to complement your text? I did. Again, I loved your series of posts. It was well written, it was superbly illustrated, clear, and it gave me great ideas. I am dowloading OPie and Miks, and restoring X-Perl right away! Thanks for the comment, Nea. I'm glad you liked the posts. The space between the chat window and the bottom of my screen is for the type line, and it has bothered me too. I'll try out one of the chat addons. I never considered one before as I find the general appearance of the default chat is fine, but being able to move the chat window down would be very handy and would tidy my screen up a bit more. Thanks for the tip.